Contact options such as phone, chat and HP Support Community are available depending on your product type. Need help finding a serial number? Search your printer for a number labeled as Serial Number, Serial No, S/N or SN. The number is printed on a label. You might need to open the ink cartridge access area or scanner lid to reveal the label. Look for the bar code stickers on your printer. The serial number on a Samsung printer can be used wherever an HP Serial number is requested. Samsung printers refer to a 'product number' as a 'model code' designated with 'M/C', and typically start with 'SL-...'. The product information label contains your serial number and product number. You can find it either on the back of your laptop, inside the battery compartment or under the cover on the back of the laptop. If your laptop is currently functioning you can find the serial number by using a simple keyboard command. 1. From your built-in keyboard, press and hold the Fn + Esc buttons at the same time. 2. 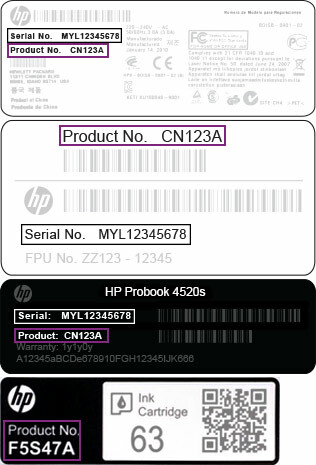 An HP System Information pop-up box will appear on your screen with your serial number. The product information label contains your serial number and product number. Depending on your desktop model you can find it on the side, top, front or back of the computer. For All-in-One PCs you will find it on the back. If your computer is currently functioning you can find the serial number by using a simple keyboard command. 1. From your keyboard, press and hold the Ctrl+Alt+S buttons at the same time.